I love this little hut over the ocean. We dubbed it our coffee hut, the spot we claimed each morning after a walk on the beach. And the roof of this little hut is rather impressive. A patchwork providing shade. One branch would not have been enough. But connected tightly and layered multiple times, it can weather the storm. It can protect those underneath it. It is important to point out the obvious. While this little hut roof of multiple branches and leaves can weather the storm… These connections and layers don’t prevent the storm. But working together they help each other get through it. Without each other intertwined, they would individually blow away… together they are virtually impenetrable. And not only do they help each other, but their bond provides a safe space for someone else. Shade for me and my pale skin. This is why our faith journey is not supposed to be private. This is why we’re called to “do life” with other people. Yes, your relationship with God is personal and unique to you, but you exist in a world with storms. And God put you and me here together so we can interwine. So we can connect. So we can create layers of protection for each other and for others. 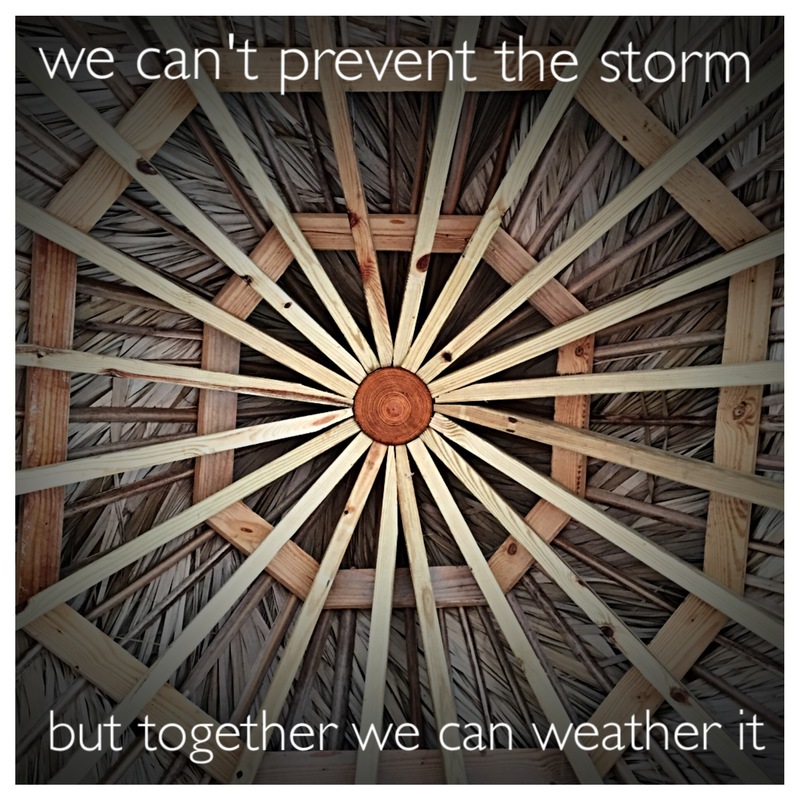 We can’t prevent the storms, but they are easier to weather when we are not alone. We’re less likely to go off course, to make wrong choices… we’re not meant to grieve alone or fight alone. I’ve heard it said that joy shared is doubled and grief shared is halved. “It” being love. So connect, interwine and layer. You are a critical piece. You are significant. When you love others… no matter if they are strangers, friends, enemies, parents, siblings, children, spouses, exes… when you love, you are protecting, trusting, hoping and persevering. You are helping someone weather the storm. This entry was posted on February 14, 2016 by jessica lynn shull in myfaith and tagged faith, God, love, relationships.